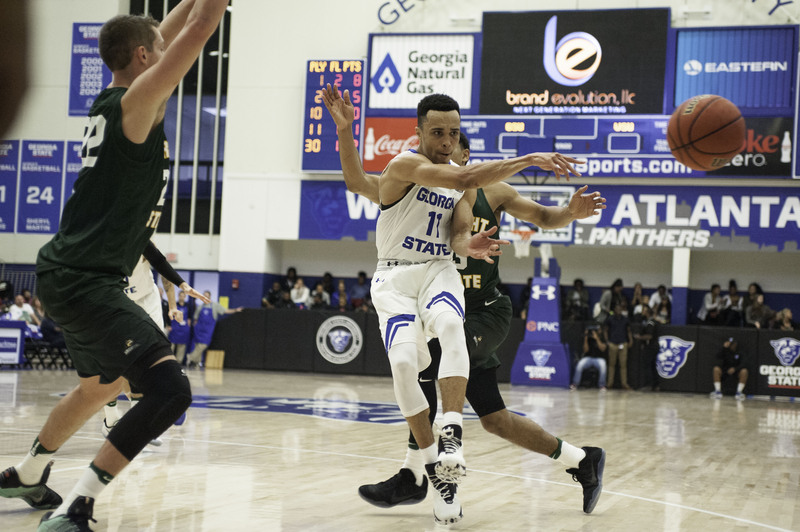 The Georgia State Panthers have been on a tear, as they returned home to the Sports Arena after completing a successful road trip against Troy and South Alabama, to extend their win streak to six. On Feb. 4, they faced in-conference foe, UL Lafayette and managed to blow a huge 52-37 lead at the end of the first half, only to win with a nail-biter on a pair of D’Marcus Simonds free throws. The final score was 85-82, which extended the Panthers’ win streak to seven. Simonds, Jeremy Hollowell and Malik Benlevi are starting to play as a big three for the Panthers as they continue to carry the team to victories with tremendous performances. Saturday was no different as Simonds put up 19 points to go along with eight rebounds. He was the leading scorer for the Panthers. Hollowell had 16 points and five rebounds, while Benlevi added a much needed 17 points and five rebounds of his own. The Panthers started the first half very aggressive with six early points in the paint. Simonds started the game strong, going 4-4 with 11 points with 3:42 remaining left in the first half. Hollowell had a game-high 14 points at the end of the first half, doing most of his damage from three-point range, where he shot 3-4. Georgia State showed great hustle early on, as their defense and offense, proved to be too much to handle for the Ragin’ Cajuns. The Panthers led the Ragin’ Cajuns in points in the paint (26), second chance points (17), fast break points (11) and points off the bench (14) in the first half. They also held their opponent to 42.9 percent shooting in the first half. With a 52-37 lead to start the second half, the Panthers allowed the Ragin’ Cajuns to go on a 9-0 run to cut into the deficit. Frank Bartley IV was the most dominant player on the court Feb. 4 as he had a career-high 31 points. His shooting from beyond the arc was impressive, as he made seven three-pointers to help his team stay within arms reach. Bartley IV was responsible for the Ragin’ Cajun’s 9-0 run coming out of halftime with two back-to-back three pointers. The Panthers felt their grip on the 11 point lead begin to loosen with just under 17 minutes to play, but they added a 9-0 run of their own to regain a comfortable 19 point 67-48 lead with 15:16 remaining on the clock. Jay Wright also had a huge game for the Ragin’ Cajuns adding 20 points and seven assists. He had a huge steal-and-dunk late in the second half, along with a key layup by Johnathan Stove to bring the Ragin’ Cajuns within one point, 83-82. However, it was not enough to secure a late-game comeback. The Panthers shot 52.5 percent from the floor, while holding their opponent to just 46 percent shooting for the game. The Panthers are now set to face Appalachian State on Feb. 11 in Boone, North Carolina. Forward Kennesha Nichols breaks through Georgia Tech’s defense to shoot a layup. 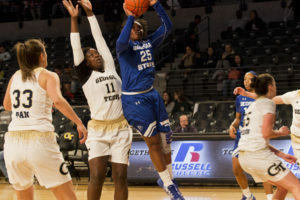 The Georgia State women’s basketball team came into the game against Louisiana riding a three game winning streak. They started the game trailing 7-3, but they quickly closed the game with a 6-0 run. Louisiana went on to close the quarter on a 10-6 run and take a 19-15 lead into the 2nd quarter. Jaylyn Gordon started the game 2-3 from three and lead the Ragin’ Cajuns in scoring with 8. Georgia State started the second half off on the slow side, scoring only 6 points in the first 6 minutes of the quarter. To make matters worse they also turned the ball over nine times in the first half. After trailing by as many as 10 the Panthers made a furious comeback to get within five at the end of the quarter, but a late three by Gordon pushed the Louisiana lead back to eight at the break. The second half was more of the same. Louisiana came out of the gate hot and extended their halftime lead to 15 at one point in the quarter. The Panthers, as resilient as they were fighting, clawed back to get within 10 points. The team gave up another back breaking three to Gordon to push the Louisiana lead back to 13. Louisiana only shot 30 percent from three the entire game, making eight, but all eight of them came at a crucial time. Haley Gerrin led the comeback effort in the fourth quarter for the Panthers scoring seven of her points. The Panthers were able to cut the lead down to 7 with 7:50 left, after Tiffany Holston split two free throws at the line. The Panthers would eventually get the Louisiana lead to as low as three points, but gave up a layup as the shot clock expired with a little over two minutes left in the game and that was as close as they would get. Louisiana would go on the win the game by a score of 70-64. “We waited until the fourth quarter to really turn it on, when the game was on the line right there at the end we played much harder and much better in the fourth quarter and you can’t wait the fourth quarter against a good basketball team and think that you could pull it out,” Baldwin-tener said. The Panthers shot 50 percent from the field, but had 21 turnovers, which was the difference in the game. Their defense was solid holding Louisana to 40 percent shooting, and out rebounding them 39-27. Everything set up in the favor to tin the game, they just couldn’t overcome the mistakes. They had three players in double figures freshman Jada Lewis scored 13 points and Sophomore Kierra Henry added nine. The other problem besides the turnovers was that they didn’t get much from their bench. The Panthers only got 16 points from their bench, when the Ragin’ Cajuns got 38 points from their bench. Sophomore K.K. Williams netted a career-high of 14 points and four assist. Holston recorded another double-double, with 10 points and 12 rebounds. The team is starting to figure things out as they are playing much better than they were a few weeks ago, they just have to play more consistent on a nightly basis. The Panthers are off until Feb. 9, when they hit the road to square off against Coastal Carolina.